Accounting, financial, appraisal, and economic experts called upon to provide expert testimony in legal proceedings need reliable models for the critical documents they will submit to the court. 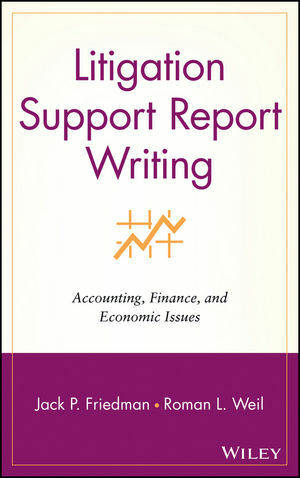 Litigation Support Report Writing collects eighteen exemplary reports from a variety of financial topics, providing professionals a comprehensive resource on this vital function. JACK P. FRIEDMAN, CPA, PhD, MAI, is the principal of Jack P. Friedman Associates, LLC, a real estate economics consulting firm. He is the author of over twenty-five books, including Barron’s Dictionary of Real Estate Terms and Real Estate Handbook, each in their fifth edition. ROMAN L. WEIL, PhD, CMA, CPA, is V. Duane Rath Professor of Accounting at the Graduate School of Business of the University of Chicago. He has coedited four professional reference books for McGraw-Hill, Simon & Schuster, Prentice Hall, and John Wiley & Sons and has coauthored a dozen textbooks. He has published over eighty articles in academic and professional journals. 1. Valuation of a Manufacturing Facility (Mike Hill and Gerald A. Keller). 2. Valuation of Stock in a Corporation (David N. Fuller). 3. Employment Discrimination (Ali Saad). 4. Wrongful Discharge (Roman L.Weil). 5. Child and Spousal Support (John D. Zante). 6. Valuation and Apportionment of Community and Separate Business Interests (Donald Gursey and Tracy Farryl Katz). 7. Apportionment of Community and Separate Business Interests (Donald Gursey and Tracy Farryl Katz). 8. Intellectual Property/Equipment (Bruce McFarlane and Lilian Quah). 9. Intellectual Property/Software (Robert L. Vigil). 10. Trademark Misuse/Rebuttal (Jeffrey H. Kinrich). 11. Personal Injury (Holly Sharp). 12. Personal Injury/Rebuttal (Jack P. Friedman). 13. Real Estate Condemnation (Barry A. Diskin and Liz W. Citron). 14. Land Use/Zoning (Neil G. Carn). 15. Construction Claims (D. Paul Regan and Colin A. Johns). 16. Environmental Damages (Rudy R. Robinson, III). 17. Shareholders’ Suit against Corporation (David Tabak). 18. Shareholders’ Suit against Corporation/Rebuttal (K. Ramesh, Susan Hoag, Gaurav Jetley).